Which is the best way to remove an existing stain from logs, media blasting or chemical stripping? Like most questions of this nature there is no definitive answer, it depends on the log home. 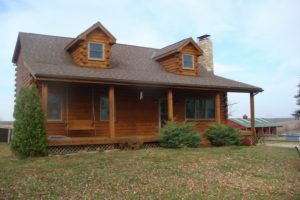 Both methods of removing an old log home finish from a log home have their positive and negative attributes and the results depend as much on the competence of the person or persons doing the work as much as the method used. But for the sake of comparison we’ll look at the features of each method to help you make a more informed decision about which method is best for your home. Although Media Blasting can be accomplished by a homeowner it does not lend itself well to a do-it- yourself project since it requires the rental of an industrial size air compressor as well as the Media Blaster unit. Although the objective of log media blasting is to strip off the existing log finish or UV damage from the logs it also removes the top layer of wood in the process. Since media blasting can be a very aggressive procedure, in the hands of someone inexperienced with media blasting a lot of damage can be done to the surface of the wood in a very short period of time. That’s one reason that media blasting is best left in the hands of professionals who have had some prior experience. In general we take the position that media blasting should be the last resort rather than the preferred method of removing an existing finish. 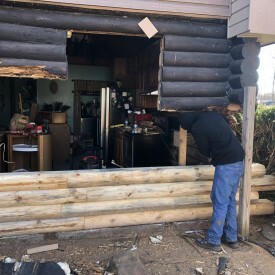 We often receive calls from homeowners who are virtually in tears after seeing what media blasting did to their beautiful log home. They call us wanting to know what they can do to restore the logs to their original smooth surface. The sad news is that the only way to restore the surface is lots of hand sanding. Of course when properly accomplished by an experienced individual who knows what they are doing, media blasting followed by Osborn brushing can result in a fairly smooth surface. However, this is more the exception than the rule. Does an excellent job removing most paints and stains. Fairly quick and cost effective. Avoids water getting into the home but dry dust and blasting media will most probably penetrate into the interior of the home. Since the blasting media consists of either recycled crushed glass or organic materials like corncob grit or walnut shells there is little chance of well or water contamination. Media blasting changes the surface characteristics of the wood. In addition to roughening the surface it increases the surface porosity. Many people consider a media blasted surface unattractive and the only way to restore the wood to a smooth surface is with lots of hand sanding. Having enough blasting media on hand is critical. You don’t want to run out in the middle of a wall since it may take two or three days to have additional material shipped to your location. 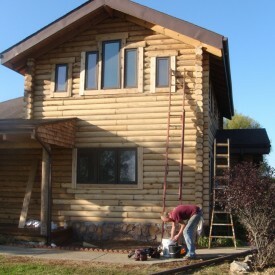 Chemical stripping a log home refers to the use of finish removers used in conjunction with a pressure washer. Since chemical strippers only soften an existing finish they must be used along with a pressure washer to actually remove the finish from the wall. As opposed to media blasting, chemical stripping is much more user friendly since all it takes is a general purpose pressure washer available at most do-it-yourself outlets or equipment rental locations and a Smart Strip Finish Remover. A pressure washer is quite a bit easier to handle than media blasting equipment and although aggressive pressure washing can still do some surface damage, it’s fairly easy to fix with a light sanding or an Osborn Buffing Brush. 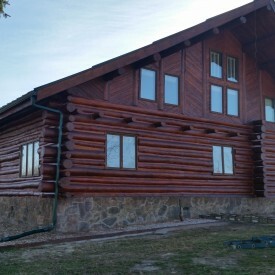 The main advantage of log home Chemical Stripping is that the use of proper procedures can result in a beautiful smooth clean surface. So why do some stain manufacturers recommend media blasting over pressure washing? Media blasting logs significantly increases the porosity of the surface thus giving an inferior finish better adhesion since the rough surface gives the finish more surface area to grab onto. Does an excellent job when correct procedures are used. User friendly. Takes little expertise and no special equipment is required. One wall can be refinished at a time. Results in a more attractive surface. Water will get into the home. Need to protect plants and shrubs from chemicals. May take more than one application to completely remove an existing finish. Must thoroughly rinse any applied chemicals before applying finish. Bottom line is finishes fail, and the sun and the rain want to destroy your wood. 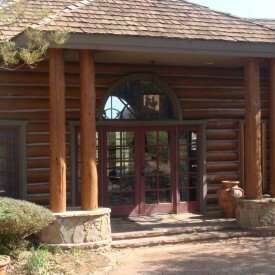 You want to maintain the value and integrity of your log home by keeping it well preserved. There are many preventative steps to take that can assist in the longevity of your wood (see prior blog posts) but, at some point. you may be facing the need to have the logs on your home restored. 888-LOG-GUYS have mastered the art of surface preparation, a most important first step. We are one of few restoration companies that are capable and experienced in all of the varying preparatory methods — and we want to give you the value of our expertise, based on 20+ years of experience. Regardless of the type of surface prep your home needs, we have the know how and professional teams in place to get the job done, beautifully!